In this unprecedented collection, Donald N. Levine rejuvenates the field of social theory in the face of lagging institutional support. 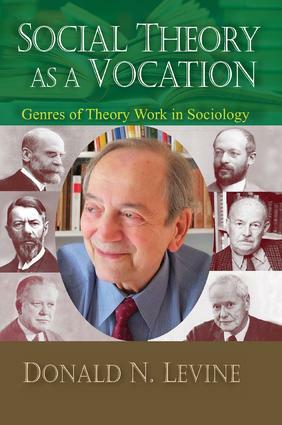 The work canvasses the universe of types of theory work in sociology and offers probing examples from his array of scholarly investigations.Social Theory as a Vocation throws fresh light on the texts of classic authors (Comte, Durkheim, Simmel, Weber, Park, Parsons, and Merton). Ranging widely, its substantive chapters deal with the sociology of strangers and the somatic dimensions of social conflict; the social functions of ambiguity and the use of metaphors in science; contemporary dilemmas of Ethiopian society; logical tensions in the ideas of freedom and reason; and the meaning of nationhood in our global era. The book includes Levine's transformative analysis of the field of Ethiopian studies, and his acclaimed interpretation of the discontents of modernity. It makes the bold move to merge philosophically informed analyses with empirical work.Finally, Levine focuses on what he views as the contemporary crisis of liberal education, and offers suggestions for ways to stimulate new efforts in teaching and learning to do social theory. This book is an integral contribution to social science collections and should be read by all interested in the future of the social sciences.